Virtual Reality courses and a -3% incline feature make the Pacemaster Platinum Pro VR treadmill one of the best and most innovative fitness machines on the market today. They even put some fun into the hilly VR Courses as you will explore fitness runs such as Lombard Street, Steeple Chase, Appalachian Trail, Summit Climb, Coastal Path, and the Tahoe Rim. 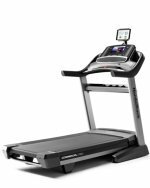 The Pacemaster Platinum Pro VR treadmill features a 12 x 15 multi-color dot matrix display plus 5 large LEDs that shows time, speed, distance, incline, calories, pace, average speed, heart rate zone, and aerobic points. One key feature is the negative incline (the deck can be lowed to a -3 angle) to simulate walking or running downhill. Among its regular programs — including High Shaper, Glute Toner, Waist Reducer, Hill Intervals, Speed Intervals, Mixed Intervals — each can be adjusted with up to 9 levels of intensity. There are also 5 Heart Rate and 3 Custom Programs. From a mechanical viewpoint, experts looking under the hood point out the quality that has gone in to the manufacturing of the Pacemaster Platinum Pro VR. They give high marks to the large 3 CPH treadmill motor, the 1000-lb thrust elevator motor, 2.5" precision rollers (with permanently lubricated sealed bearings), a 1" thick stretch resistant belt (rated for 10,000 miles), and the maintenance-free phenolic surface deck. 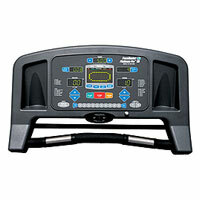 The decline feature makes the Pacemaster Platinum Pro VR a unique find, and treadmill reviews are enthusiastic about the overall packaging and design of this machine. It rates highly in virtually all areas including noise level, cushioning, power, ease of use, programs, warranty, and dollar value. At 205 pounds, it is a lighter machine than competitors, yet it can still handle a heavier individual without any shake or wobble. Note: If you want this Pacemaster package, but don’t want to pay extra for the two key features, the negative incline and the Virtual Reality courses, save $200 and get the Gold Elite VR. 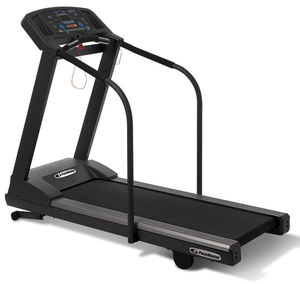 With the most programs/variations of any treadmill in the industry, the Pacemaster Platinum Pro VR carries a solid reputation for reliability and craftsmanship. It’s no wonder that this model along with the Gold Elite VR are number 1 and 2 on Best Buy Lists in the $2000-$2500 price range. For $2,499, you’ll get years of comfort, performance, and reliability, and you will look forward to doing your morning runs on this great machine. The Pacemaster Platinum Pro VR treadmill is highly recommended.